Get it Laser Straight, every time! Laser Straight uses the latest Refractive Lens Technology to lay down a level 50 ft. line. Hang pictures, shelves, curtain rods and more with professional results! 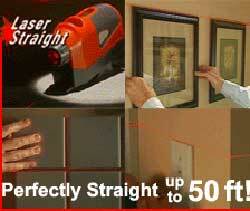 Laser Straight makes difficult do-it-yourself jobs easy. Just position it on any surface and press the button to project a perfectly straight 50-foot line anywhere. Its advanced technology even goes around corners! It sticks to any surface, but leaves no marks behind. Includes 4 strips of reusable adhesive. 4 1/2"x2 1/2".